Last year at Easter Willow got 'Rab Rab' from the Easter bunny. He is just an Ikea Rabbit toy, but he is still, a year and a bit later, her very best friend! She takes him EVERYWHERE. This is new to me because Ezra was never really into stuffed toys, when he was about 2 he got slightly attached to 'Pup Pup', can you guess what kind of animal Pup Pup is, it might be hard because my kids are super original when it comes to naming stuffed animals. Pup Pup is a dog, der! The Golden Retriever, from Ikea! They have a thing for Ikea animals I guess! But, her love of Rab Rab started her love of Rabbits. She met a real life Rabbit the other day in our neighbours yard (a pet one), and she proceeded to make it and Rab Rab kiss the whole time!! HA! Hilarious child! 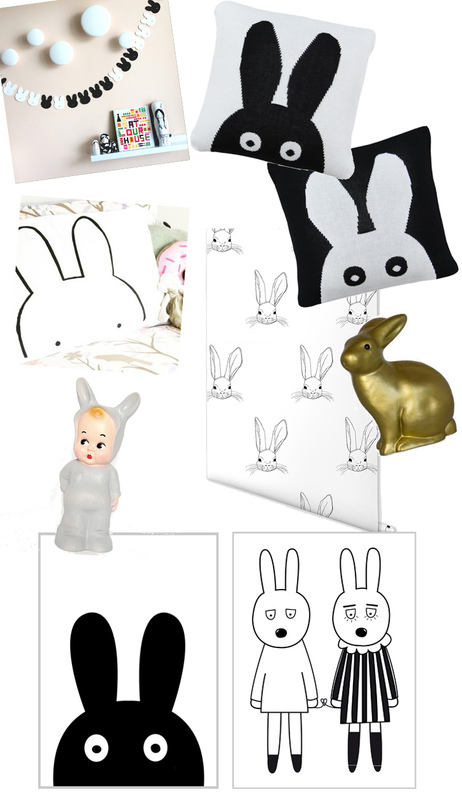 So with the Rabbit theme in the back of my mind I've been noticing some really awesome Rabbit themed kids decor items around lately, and so I thought I would share some of my favourites! I probably wouldn't go as far as to put it all in ONE room! But, its nice to have an idea of what is out there.